The English pig herd increased by 2% compared to a year earlier, to over four million head, according to the June Agricultural Survey figures published by Defra. The increase in the total number of pigs was mainly driven by a 2% increase in the number of fattening pigs, compared to the previous year, to 3.6 million head. Most weight bands actually recorded a decline in numbers, with the overall increase entirely driven by numbers of piglets under 20kg (+9% year-on-year). Clean pig slaughterings have indeed been lower in recent weeks, but these latest figures suggest an uplift in throughputs can be expected towards the end of the year, AHDB analyst Bethan Wilkins said. “Nonetheless, trends from the June survey in previous years have not been supported by subsequent slaughterings, so the results should generally be treated with some caution,” she added. The overall size of the breeding herd reportedly declined by almost 2% to 408,000 head. Within this, the female breeding herd recorded a marginally larger decrease of just over 2% to 327,000 head. 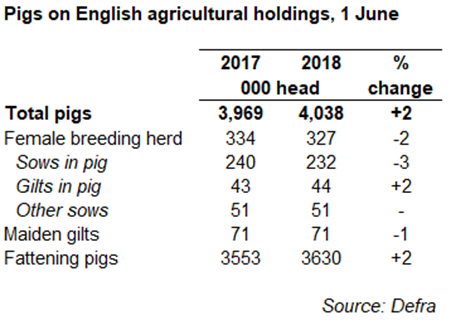 This reflects an over 3% decline in the number of sows in-pig, at 232,000 head; numbers of others sows were stable while gilts in-pig increased by 2%. “The reduction in sows is perhaps not unexpected, given the high sow slaughter rate early this year. Although, this followed from a period of low culling rates in early 2017, and was not necessarily expected to translate into a decline in the herd size,” Ms Wilkins said. “These figures suggest producers have not been retaining enough gilts to compensate for the higher sow slaughter, perhaps due to uncertainty in the finished pig market impacting on producer decision making. 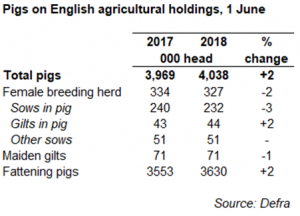 However, the very large increase in piglet numbers as at June, and the higher production of sow breeding feed this year, casts some doubt on the reported overall breeding herd decline.